"Although growth remains the CEO's biggest priority, there was a significant fall in simple mentions of it this year, from 58 percent in 2017 to just 40 percent in 2018. This does not mean CEOs are less focused on growth, instead it shows that they are shifting perspective on how to obtain it," said Mark Raskino, vice president and Gartner Fellow. "The 'corporate' category, which includes actions such as new strategy, corporate partnerships and mergers and acquisitions, has risen significantly to become the second-biggest priority." 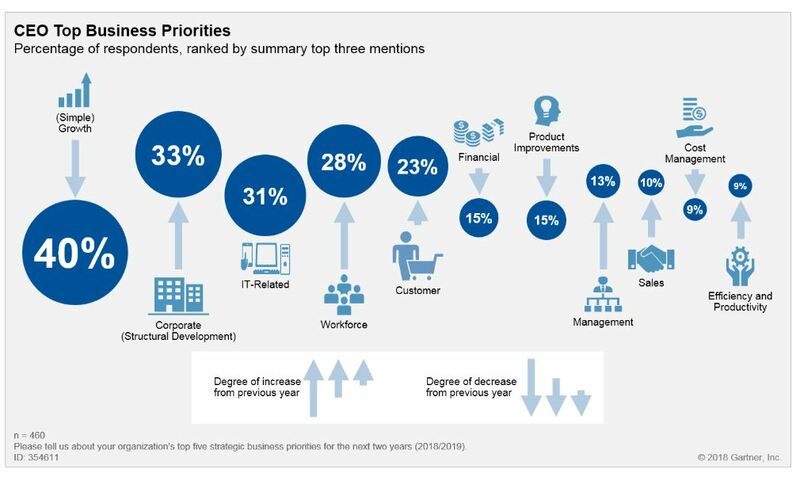 The Gartner 2018 CEO and Senior Business Executive Survey of 460 CEO and senior business executives in the fourth quarter of 2017 examined their business issues, as well as some areas of technology agenda impact. In total, 460 business leaders in organizations with more than $50 million in annual revenue were qualified and surveyed. IT remains a high priority coming in at the third position, and CEOs mention digital transformation, in particular (see Figure 1). Workforce has risen rapidly this year to become the fourth-biggest priority, up from seventh in 2017. The number of CEOs mentioning workforce in their top three priorities rose from 16 percent to 28 percent. When asked about the most significant internal constraints to growth, employee and talent issues were at the top. CEOs said a lack of talent and workforce capability is the biggest inhibitor of digital business progress. Culture change is a key aspect of digital transformation. The 2018 Gartner CIO Survey found CIOs agreed it was a very high-priority concern, but only 37 percent of CEOs said a significant or deep culture change is needed by 2020. However, when companies that have a digital initiative underway are compared with those that don't, the proportion in need of culture change rose to 42 percent. "These survey results show that if a company has a digital initiative, then the recognized need for culture change is higher," said Mr. Raskino. "The most important types of cultural change that CEOs intend to make include making the culture more proactive, collaborative, innovative, empowered and customer-centric. They also highly rate a move to a more digital and tech-centric culture." In the background, CEOs' use of the word "digital" has been steadily rising. When asked to describe their top five business priorities, the number of respondents mentioning the word digital at least once has risen from 2.1 percent in the 2012 survey to 13.4 percent in 2018. This positive attitude toward digital business is backed up by CEOs' continuing intent to invest in IT. Sixty-one percent of respondents intend to increase spending on IT in 2018, while 32 percent plan to make no changes to spending and only seven percent foresee spending cuts. "CIOs should leverage this bullish sentiment by encouraging their business leaders into making "no way back" commitments to digital business change," said Mr. Raskino. "However, superficial digital change can be a dangerous form of self-deceit. The CEO's commitment must be grounded in deep fundamentals, such as genuine customer value, a real business model concept and disciplined economics." More detailed analysis is available to Gartner clients in the report "2018 CEO Survey: CIOs Should Guide Business Leaders Toward Deep-Discipline Digital Business." Mr. Raskino will further examine key CEO and CIO issues during the Gartner's CIO Leadership Forums and CIO & IT Executive Summits. Follow news and updates from the events on social media using #GartnerCIO.